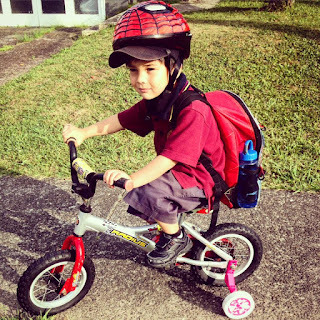 Unabashedly riding his red motorcross themed bike to school with pink training wheels with hearts on them. I love how it would never occur to him that one might be embarrassed to ride this to school. Lucky the kids at his school are so lovely, the big kids really look after the little ones so he is safe. Also, he's a bit lazy and I subtly have to push him up any slight incline.